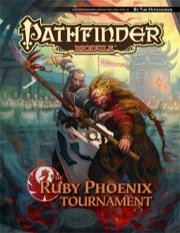 The Ruby Phoenix Tournament is sanctioned for use in Pathfinder Society Organized Play. Its Chronicle Sheet and additional rules for running this module are a free download (236 KB zip/PDF). I just got home from playing this bad boy all in one sitting. Took us about 14 hours, with quite a bit of goofing off happening. Probably takes about 12 hours normally. I absolutely loved every moment of it. The combats are all pretty fun an unique, growing steadily in challenge from quick and easy victories to truly engrossing brawls. We had an easy time of it throughout, but we played with 5 players (for PFS, so our GM was not allowed to scale anything unfortunately) who are all experienced with fairly optimized characters. The encounters are cool as heck, all of them using different kinds of dangers to keep players on their toes. I play a battlefield control + support cleric, and never lacked for opportunities to make important differences to combat dynamic. Beyond combat, there is an actual story that is pretty neat if you choose to do all the optional things. Almost every challenge allows for creative solutions without handing you all the rewards on a silver platter. I think this may be the most fun I've ever had in a single day of gaming. While much of that owes to the amazing group of people I had the privilege of playing with (including GM), the module didn't slouch in creatively designed and appropriately challenging combat challenges, non-combat skill challenges, social challenges, RP opportunities, or atmosphere. Everything just tied together beautifully. This module was the cause of my hiatus from review-writing. As all modules, it was a very involved experience for me to prepare this module. I spent probably at least 20 hours over two-three weeks to prepare this. As such, I feel justified for any opinions I have to share here. I thought this module was absolutely lame when I read and prepared it. In my mind, it was just fight after fight after fight. However, when I ran it, I was very pleasantly surprised how well-paced it was and how each "Day" of the Ruby Phoenix Tournament was very complete and satisfying. My players also managed to stay very engaged throughout the entire 12+ hour long escapade. When I prepared this module, I felt as though each fight would be near identical but when it actually played out, I think all my players got a chance to "shine" as each fight was sufficiently different to allow different abilities and skills to be advantageous. The Ruby Phoenix Tournament is basically the Golarion Olympics. It consists of 5 grueling days of fight, exhibitions and challenges followed by a night of revelry. Each day consisted of roughly one tough fight, one easy fight, one skill challenge and then a role-playing encounter. It integrated some fun elements from different movies and tv-series to weave an asian themed ku-fu championship. In addition, there was an underlying plot of corruption which added a deeper layer of intrigue and revenge. This module utilized almost every single character class all the PFS rulebooks. I consider myself an experienced DM in 3.0, 3.5 and PFS and still had to spend a significant amount of time preparing and re-reading everything from spells, abilities to combat maneuvers. However, I also found it very fulfilling to have achieved this because running a high level complex module - imo demonstrates a level of proficiency and mastery over the PFS system. This is an 11th level module so needless to say, it's expected that the players be experienced and know their own strengths and weaknesses so as to prepare accordingly for a 5-day tournament. I warned my players in advance to ensure that they equipped themselves appropriately. There were also opportunities for each class to draw into different abilities so that no fight is quite the same as the last one - and no opportunity for the same trick to work twice. Spoilers follow. This review is from the viewpoint of a player, not a GM. I'll get the good parts out of the way. The battles are varied with a some interesting environments and situations to fight in. I don't recall any fight that felt repetitive or similar to any other from the adventure. I commend the variety of opponents pitted against us. - We played this module under the older PFS rules, where you could create an 11th level PC to play with. The PCs we played were heavily built on damage dealing, so many fights, even the supposedly more dangerous ones, were over quickly (within 2 or 3 rounds). - The performance combat rules, despite adding the interesting combat bonuses (or penalties, depending on your rolls), introduced a nice dynamic, but unfortunately our party mostly plowed through the encounters where the rules could have been appreciated more by allowing the encounters to last longer. Even when I was prepared to take full advantage of the performance combat rules, the rest of the party had different ideas and the fight was over before I could build up a relationship with the crowd. I don't fault the module for this - performance combat could probably stand to receive some more fleshing out with more incentive to use them. - Many significant boss type encounters only had a single opponent, so there was little to force us to decide how to best use our action economy. This made many of those fights too easy. Overall, I enjoyed my time playing the module. However, my one-time experience of playing it with an 11th level party lacked the nail biting elements that come from high level play. Balancing a module and enemy builds against a typical 11th level party can be a difficult thing, since the game at that level can many times be much less than typical. In my case, it was a series of enjoyable combats, but the lack of regular difficulty was disappointing. NOTE: This review is intended for GMs. Spoilers galore. Probably the most difficult challenge for module author is how to pack content into just over twenty pages. Tim Hitchcock proves again that he can excel under severe constraints. Note to my esteemed colleagues who posted astonishingly short reviews: Use of Ultimate Combat content is optional. While I agree that UC gladiatorial rules rate very low for introducing yet another standalone and incompatible subsystem (just like the firearms cost or firearms point blank shooting or Jade Regent caravan fiascos), they can be safely ignored. You're also free not to use weapons, spells or classes... or just read online version of UC. Finally, all oriental elements are easy to replace with standard fantasy stuff. SPOILERS BELOW. You were warned! So what your players can hope to experience by participating in the tournament? Well, there is the standard plot of "win several fights and get fabulous items". In between fights, the PCs are sent forth to overcome complex challenges devised by tournament supervisors. Meanwhile, in shadows, a sinister plot is slowly building momentum toward the blazing secondary finale. - rescuing a hostage means that severely hurt PCs gain powerful ally in the finale. The module is highly compressed. That means that you, as a GM, are expected to think for your NPCs, come up with tactics and research statblocks. Additionally, some story parts are handed down using rather crude methods (a body of kidnapper with a note pointing toward secret meeting point... seriously), however, since Tim had to work in clues for PCs and fit it into really tight space, this is both acceptable and easily amenable. You are also required to make several leaps of faith and creativity (one would expect other contestants to be able intervene when all hell breaks loose, the fight against dragon - the one where the PCs get to attack - is not set properly... that is to say, it is not included in module text at all). Probably the most irritating part for me would be juggling statblock of all extras - all these "use default statblock for X, just change it here and there" get tiresome after a while. I do not mind missing encounter descriptions though - I like to add my own content. This module occurs largely in open spaces. The action moments occur frequently, easily exceeding standard default CR and encounter ratios. At the same time, risk of dying is limited through several safety nets, like paladin patron, presence of clerics (played down, but still there) or by the fact, that the PCs may try to make a few friends to get them to help later (saving bacon of other contestants may, and should, in my opinion, result in NPC boons or returned favors). Of course, the blazing finale is no-holds-barred fight, but again, falling while doing a huge favor for a dominant church may yield a free resurrection or two. Most of the challenges, especially the side shows, add lots of fun. The fight on cliff walls is going to be interesting, but the fight in the port, with dragon picking strays from above and opponents jumping from one boat to another is going to take the spotlight, probably even overshadowing the final finale. Verdict: 5/5, Heartily recommended, Requires GM's work. GMs should monitor developments in order to avoid TPK. The encounters in this module require access to the content of Ultimate Combat. Announced for November! The cover image is a mockup, and will change prior to publication. A tournament module that is a niche I haven't seen filled yet. But it does make me thin of "Dragon ball", not "Dragon ball z" because your only level 11, but still cool sounding none the less. Sounds frickin' sweet!! Nice idea, Tim! I'm looking forward to it. Oh, I am so grabbing this when it comes out. Wish it was coming out earlier though, my PCs are on their way to the token Oriental place in my campaign world and this would have been a fun diversion. I am assuming this is somehow linked to Season 3 Year of the Ruby Phoenix metaplot for PFS. If this is anything like the Challenge of Champions modules from Dungeon magazine, I can't wait to read this!! Gentlemen, welcome. You honor our island. I look forward to a tournament of truly epic proportions. We are unique, gentlemen, in that we create ourselves... through long years of rigorous training, sacrifice, denial, pain. We forge our bodies in the fire of our will. But tonight, let us celebrate. Gentlemen, you have our gratitude. Disclaimer**** Any incorrect Spelling of "shidoshi" is blamed on Belgium. Enough talk. WE MUST KUNG FU FIGHT! Out of curiosity how difficult would it be to mix this in to the Jade Regent Adventure Path? Seeing how they are both Tian Xia adventures and according to the preliminary info on the AP by the time the PCs are in Tian they should be just about lvl 10-12 which is right for this module. We are building a fighting force of extraordinary magnitude. We forge our tradition in the spirit of our ancestors. You have our gratitude. They've spelt the author's name wrong: it should be Tim "Whose work is amazing" Hitchcock. Keep in mind that Tian Xia is Golarion's version of Asia, though - so this module could possibly be as far away from where the AP takes place (Minkai), as Tel Aviv is from the Kamjatka (or however you Engilish-speaking types spell it) peninsula. (For the record, I doubt it's that far apart; if I remember correctly, Goka is the "Hong Kong analogue," whereas Minkai is the "Japan analogue." I'm not saying it's not possible, just that Tian Xia is a lot bigger than the Inner Sea region. 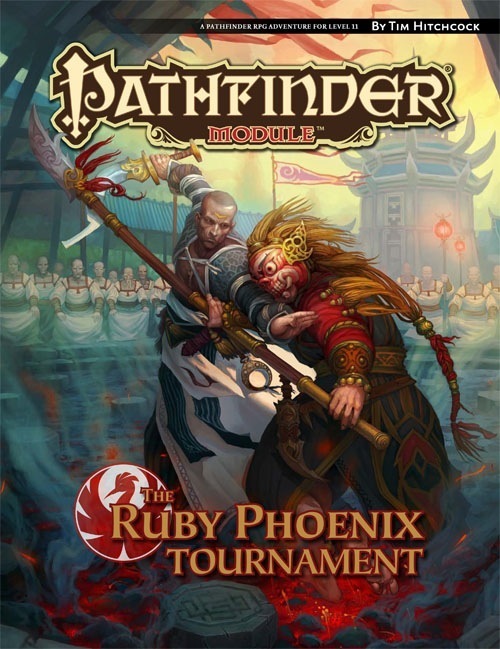 If you want to include this module in a campaign, you may want to check out the Season 3 Pathfinder Society Scenarios, though, as the metaplot of this season is supposed to be about gaining entry into the tournament for representatives of the Pathfinders. Honestly, the location aspect is why I was curious about the difficulty. I unfortunately have little to no opportunity to play PFS games no matter how much I may desire to. So I don't really pay attention to the scenarios. Add the fact my gaming group prefers to play campaign style with a long overarching story rather than one shots. (For some reason I can't get them interested in the PFS games though) If it can be done with only minor tweaks then good. Part of the reason I get the modules is that most of them seem to be able to be shoehorned into an AP in one way or another. Well, the Society Scenarios are just shorter modules. Nothing's stopping you from looking them over and stringing together a non-Society related campaign from them. "The Pathfinders must win this tournament." Looking forward to learning more about Goka. It's actually rather easy to sew together a comprehensive campaign from the PFS scenarios. I'm putting one together now. If the location that is described doesn't work for you, it is simple enough to move a scenario to the proper city or country. It also makes tracking leveling very easy. Use the Society method of leveling, advance a level after three scenarios. I don't bother tracking XP in APs or anything anymore. Just level up the characters at appropriate times. So much easier than all the bookkeeping involved in tracking XP. The other advantage PFS Scenarios have is that they are short and easy to play. Build a metaplot of your own around the scenarios and you have unlimited playing potential. Back on subject... I am curious but what is a Tournament Module? What levels will be used to play this module within PFS? Are we looking at a mod for 10th & 11th level characters, or will this be a retirement module for 12th level characters? This is an 11th-level adventure, and there are currently no plans to treat it any differently than any other sanctioned module. There will likely be a more extensive rules document suggesting ways to more thoroughly integrate the adventure into the larger Pathfinder Society metaplot, as the adventure doesn't assume the PCs are Pathfinders, or even from the Inner Sea region, but beyond that, it should function like any other Pathfinder Module. If I'm not mistaken, a "Tournament Module" would be one of the Convention Modules that are run each year at certain events. The Tournament Modules premiere each year at GenCon, and afterwards are made available to be run at other conventions. These will typically require a minimum of four tables w/ 6 players each to run, if I recall correctly. After 1 year since its release, it is made available for purchase via the Paizo website. The first of these modules for Season 2 ("Year of the Shadow Lodge") was just made available for purchase and can be run at local events that aren't conventions at this time. For it to be PFS Legal, however, a minimum number of players (outlined in the module) will have to play and report that they played the mod. The most recent event for Season 3 ("Blood Under Absalom") is the convention-exclusive mod for this year. It won't be available for purchase until August 2012. Keep an eye out for conventions in your area to learn where they will be running the game next. Actually I think it just means that the events described in the module are a tournament, rather that the PFS specials. Is this cover art still mock-up or is that the finished art? Thanks. I hope the final cover looks more "realistic." That mock-up looks more cartoony than I expect for Paizo's covers. Do you know where it originally appears? It's from the Jalmeray entry in Inner Sea Campaign Guide, I think. is there a new monster in this? Any idea when the PDF will become available for download? About a week and a half after we ship it to subscribers. The page has not been updated to say when that is exactly like other upcoming products. Masika, if the page hasn't been updated, it means that we don't have a precise ship date yet (due to potential customs holdups, shipping delays, etc.). Any word yet on whether it will be using the performance combat rules from UC? Performance combat will not be required to run the adventure, but there is a section at the start discussing how to use those additional rules to enhance the experience. We must make a team-up and inflict the pain of our kung fu feet on the hideous snake people! And two-thirds of the Ultimate Combat classes. As someone with no interest in oriental-themed adventures, I'll be glad when you folks are finally done with all this and move on to something else (I know, pirates are next. You're going to have to shine to offer more than the fantastic Freeport environment). You've really blocked off an exceptionally large chunk of the catalogue for this one.